Amrit originates from Sanskrit amrita, which means immortal. Amrit - the book in your hand is a work of deep love and wisdom from the immortal sage Mahavtar Babaji as communicated to Guruji Naushir. 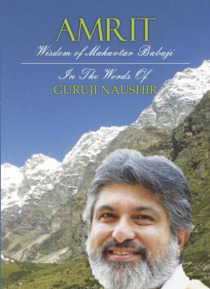 It is a guide for practical spirituality filled with incisive insights and spiced with love and humour. It touches all aspects of life and enumerates on hot to be IN the world, but not OF this world; m… aking our journey on the planet balanced, enjoyable and elevating.